Sometimes when asked about the spelling of our boat name I remind people it is a palindrome, the same forward and backward: QAYAQ (as opposed to the various spellings we get like Qayak, Quyaq) I tell them it is like another palindrome: “A man, a plan, a canal, Panama.” Now we are here in Panama and have had a chance not only to read about the amazing accomplishment of the canal but to transit it ourselves. We both read the book The Path Between the Seas by David McCullough in which he details the history of the building of the Panama Canal from 1889 to 1914. The canal was begun by the French as a private enterprise and continued and completed by the United States government. It was completed ahead of schedule and under budget. It was an amazing engineering feat, and, to this day, some of the locks are still the original, most of the concrete work has survived and still functions after nearly 100 years. The dam which controlled the Chagres River and created the Gatun Lake is 800 meters wide at its base and tapers to 30.5 meters at its top. It has stood with no failures for almost 100 years. The Atlantic and Pacific Oceans are joined here by 6 locks and a huge lake over the distance of only 50 miles. 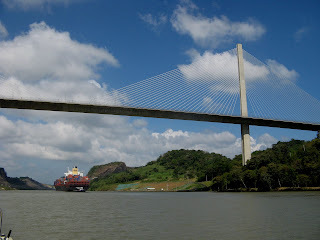 We were invited to join a sailboat to transit from the Atlantic to the Pacific side of the Panama Canal. Word of mouth allows private yachts to find line handlers, at least 4 of whom must accompany them on their transit of the canal. They also pick up an “advisor”, a canal employee who guides and advises them and their line handlers through the transit. By picking up other boaters, they avoid paying professional line handlers, but, according to our hosts today, if the Canal Authority were aware of the casual arrangement, they could be fined. We have our boat in Panama City on the Pacific side. Thus we took a bus for $2.50 to Colon, the Atlantic side, a 60 mile, 2 hour bus ride. There we caught a cab to the Colon Yacht Club and called our hosts. They brought us out to their boat on their dinghy and there we awaited our advisor to be dropped off. As it turned out, we had an advisor and trainee. 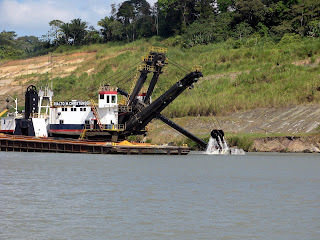 We left at around 5:30 PM to transit the Gatun Locks, a set of 3 locks that lead up to the Gatun Lake, an artificial lake that covers 423 square kilometers (153 square miles approximately) created when the Chagres river was dammed. It took about 4 hours to drive into the locks, be lifted up 87 feet then drive onto the lake. There we were secured to a huge buoy for the night. Our hosts were a generous and fun crew and we enjoyed our dinner and evening with them. We were up late telling stories, so, when 6:30 rolled around and the new advisor arrived for our day’s journey through the rest of the Canal, we were not, any of us, well rested. We were awakened by the ear splitting sound of the howler monkeys in the jungle around the lake. Good alarm clocks, those monkeys. We set out across the lake, a 4 hour voyage (22.6 miles) to the Pacific side locks. This took us through the flooded highlands of the lake and through the famed Culebra Cut, the most vexing of the Canal construction issues. This is the cut through the spine of mountains in the center of the country. 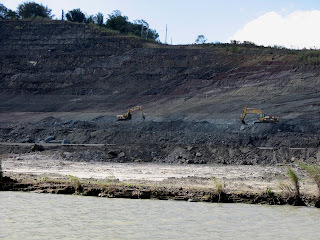 Despite excavating for nearly a mile in width to create the 213 yard wide canal, landslides continue to plague the area to this day during the rainy season. We saw evidence of ongoing dredge work as we transited the area. Our advisor and trainee were personable and full of information about the canal. In order to become an advisor, they need a college education and command of English. Then they work for many years building seniority. In the most senior phase, they transit the canal on huge freighters and can get a salary of 120K/year, a huge sum for Panama. Our advisors were bright and fun. 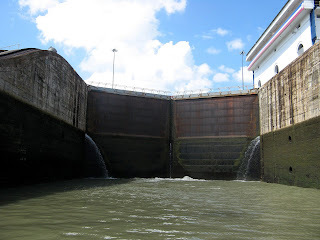 We lowered the boat through the Pedro Miguel locks and then through 2 locks at Miraflores before the gates opened to the Pacific. Another of the challenges of the locks is that tides are negligible on the Atlantic side, inches at most, and huge on the Pacific side, up to 20 feet. 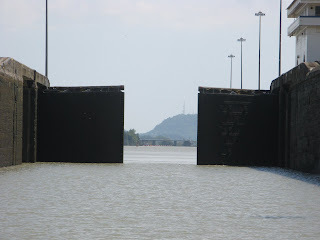 The locks allow the ship to be lowered to the current water level at the time of transit. While we didn’t see any, alligators and manatees live in the Gatun Lake (which did constrain our plan to swim when we arrived there…), they are reported to be in the lake by all 4 of our advisors. Also they told a story of a fisherman killed by an alligator a few months earlier while fishing from shore. 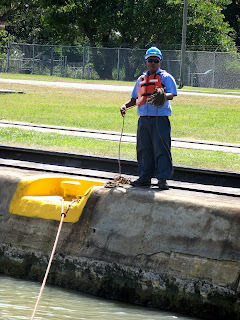 While in a lock, the boat is secured to the walls on each side by huge ropes and the line handlers (us) feed out or pull in the lines to keep the boat lined up as the water rises or falls. 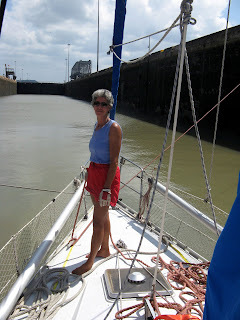 We were rafted to another sailboat boat both days of our transit through the locks. 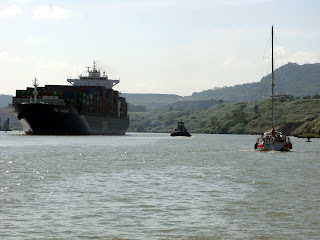 The first night, we followed a huge freighter through the 3 locks and, the second day, our two rafted sailboats were the only 2 boats in the locks. Very strange we thought as there were at least 20-30 boats waiting to transit on each side of the locks. 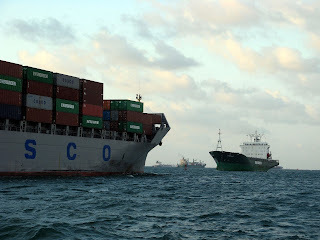 We had an uneventful transit, the best kind and were safely back to our own anchorage with our new friends anchored nearby in the mid-afternoon of the second day. We were both awed by the engineering of the Canal having read the story and appreciated the complexity. For anyone seeing it without the background, it was a rather uneventful passage through 6 locks and a lake. Still it boggles the mind that men thought to connect the 2 great oceans, completed the task and that the work done almost a century ago still functions nearly perfectly. Our hats are off to the many people who contributed to such an amazing human accomplishment. They also controlled yellow fever and malaria outbreaks to complete the accomplishment. Businesses are still required to fumigate for mosquitoes twice/year according to the owner of a tienda we visited where we saw the fumigation notice in the bathroom. The rest of the story is well worth reading so we’ll leave it to you if you’re interested.